Sorry, Illinois, Massachusetts, Tennessee and 31 other states. Springfield, Vermont, has won the coveted title of "Springfield." You know, from "The Simpsons." A video featuring a large pink doughnut, a Homer Simpson look-a-like, and hundreds of enthusiastic Springfield residents chasing Homer chasing the doughnut convinced thousands of people to vote for the Vermont video, in a contest sponsored by USA Today. 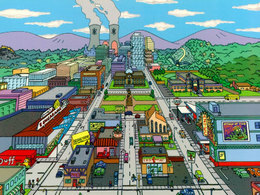 The Vermont town of 9,000 beat out 13 other Springfields that were vying to be the Springfield. The town will host the world premiere of "The Simpsons Movie" later this month. To Springfield, VT, we say congratulations! Your cromulent efforts have embiggened us all. To all the other Springfields, well, [annoyed grunt].